artistry development, life skill activities and more! Special Class by Celebrity Makeup Artist Jasmyn White. 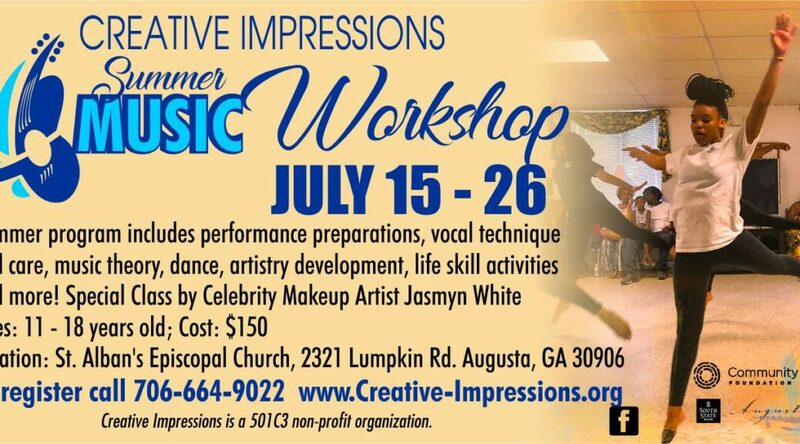 Learn more about Creative Impressions online HERE! The Jessye Norman School offers two completely free summer camps every year! Campers spend three weeks working in art, dance, drama, music, or photojournalism. Each camp culminates in a performance and art reception on the last day of camp. All campers must submit an application to be considered for one of the summer camp sessions. If your child has never attended the program you will be contacted regarding an audition. Collage: Creative Arts Camp, which began in 1982, introduces children from all walks of life to many areas of the arts in active, exciting ways. It is a day camp (9 AM to 2 PM) for children entering five-year-old Kindergarten through entering fifth grade. Middle and high school students participate in the activities and provide encouragement and assistance. Local arts professionals create age appropriate, hands-on experiences with brass, string, woodwind, and percussion instruments, dance, drama, chorus, weaving, art, storytelling and creative writing, and puppetry. The children romp enthusiastically through a rotation of six different classes daily. Each week presents a new set of classes for exploration. Cost: Tuition is $125 per week. Scholarships are available. The Augusta University Band Camp is open to rising 6th-12th grade band students who have at least one year of experience. It provides middle and high school students with intensive musical experiences and plenty of fun. 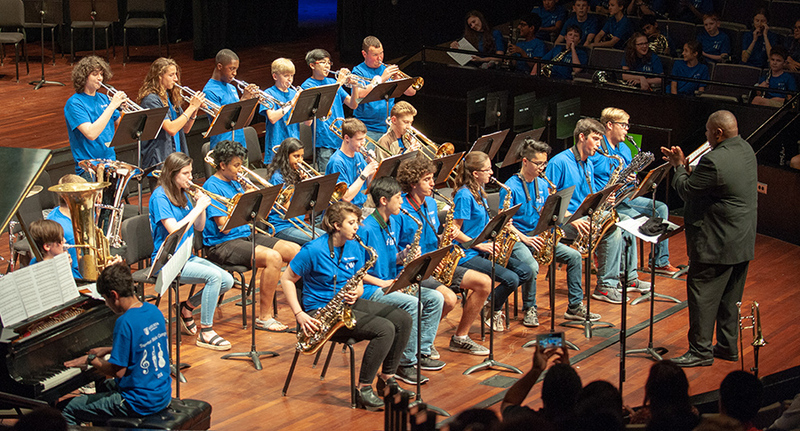 This year’s camp will include the large ensemble, jazz band, jazz improvisation class, masterclasses and electives. Our program will separate middle and high school students as they work on music that is appropriate for their skill level. Monday, June 17th – Thursday, June 20th, 8 a.m. – 5 p.m.
Students will eat lunch together every day at the Jaguar Student Activities Center. Lunch can be purchased or students may bring their own lunches. The Friday evening concert is at 6:30 p.m. and is a demonstration of much of the music the campers have worked on throughout the week. The concert will be in the Maxwell Performing Arts Theatre on the Summerville Campus and lasts approximately 90 minutes. The concert is free and open to the public.